When I was searching for User Management Product I stumbled to Netman Desktop Manager. But when I read actually the homepage of the manufacturer they were presenting as a Server Based Computing product (but it could be used with Citrix Presentation Server/XenApp), but it is offering also some kind of application management. This combination made me curious so I decided to download the product and evaluate the product. In this review the results are written down. Netman Desktop Manager can both be used on workstation as Terminal Servers. When using a single Terminal Server H+H Software recommends the installation on the Terminal Server. If the environment exists of more servers, workstations or a combination of those you need to install a server and client part. The server part can be installed as a server role on an existing server. When more than 20 clients are involved a dedicated server is recommended. The server part installation is pretty straight forwarded without any needed requirements. The product creates a web services and uses file shares, which all are created during the installation. You need to secure the shares manually; this is not carried out during the installation. It's remarkable that the default installation a folder in the root of the system drive is. When the installation is finished automatically the license wizard starts and you need to fill in the serial information. Secondly the client needs to be installed on the systems. There are several ways to accomplish this. The first option is to install the client from the network share automatically created during the installation of the server component. The second way is to create an unattended installation via Installshield unattended possibilities and distribute using your software distribution software. The third and last option is using the push mechanism delivered by NetMan Desktop Client Distributor. In this tool machines can be added and installation pushed to the clients. This client is needed both on the Terminal Servers as the clients connecting to the Terminal Servers. 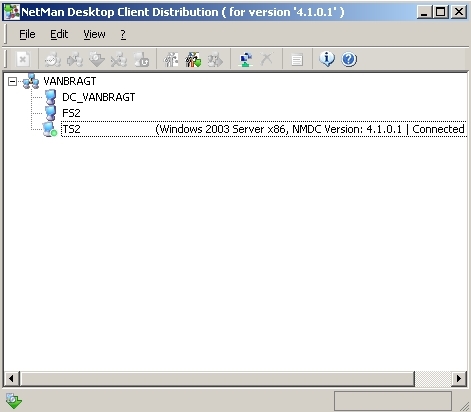 The configuration is done in several utilities, which are reachable via the NetMan Toolbox. When running the first configuration you need to start NetMan Settings component where you configure the global settings like the share settings, language settings, LDAP configuration and default configuration which should be loaded. Also in this component configurations can be made for global internet filters (more about this later in this review), global network resources, connection settings for drive letters and managing client drive letters accessibility (write/read access). The main component for configuration is the Management Console. In this management console a so called Desktop can be created. In the Desktop applications can be added, which are available on the Terminal Servers for the users. In this part the User Management part is visible. In the traditional Server Based Computing products you can create published applications by pointing to the executable only, but Netman Desktop Manager makes it also possible to configure the application completely (as within the specific User Mangement Products). Beside the standard settings like registry settings, drive mappings, printer mappings and script execution there are some functionality options which are pretty unique. Good examples are the possibility for mapping VirtualCD's, selection dialogs and directory selections. Also added value are the simple but powerful options to deactivate the applications (users will get a personalized message why the application is unavailable) and/or configure on which way the applications can be accessed (more on this in the paragraph User Perspective). Every settings can be filtered based on several conditions, so you can configure specific settings for different user(goups) within one application shortcut. By default every application is published in the Start Menu and the Desktop, I could not find a configuration setting for specifying such options. It is possible to create more so called Desktops. A Desktop/StartMenu combination can be connected to NetMan User or Client (called station). Personal I would like to use AD Groups within this part, but this is not supported. In a NetMan group AD users can be assigned, but it is not fully clear to me when a user account is available to select in this part. Netman Desktop Manager has also the possibility to load balance the user between the Terminal Servers based on user load or a combination of CPU/Memory usage. Also using IP-addresses access to the Netman environment can be allowed or denied. The last feature worth mentioning is the Internet Access Filter ( which makes it possible to allow or deny access to websites out of the Netman Desktop environment) and an embedded PDF solution. 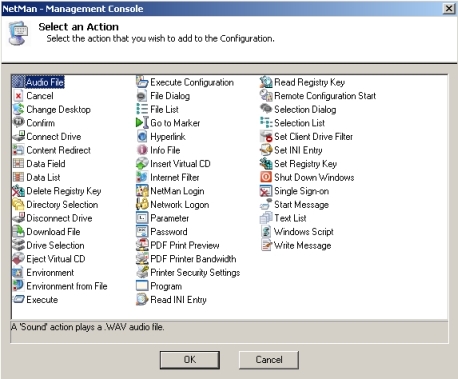 In this configuration the product is actually working a User Management product for the configuration of the desktop by assigning application (and application settings) to the session. This method is comparable with the Citrix PNAgent functionality. The configured applications are displayed in the users Start Menu and Desktop. The last methodology is using a Web Interface component. Via Internet Explorer a webpage can be started and by specifying the username and password where application icons are displayed. H+H Software is also offering a Netman SSL Gateway software component to encrypt the traffic in SSL tunnel (for remote access). When using Published Applications the applications are offered seamless to the users in a neat way, but it has the same issues when using local and remote applications next to each other (that all the remote applications are displayed before the local application when one remote application is chosen. The Netman Desktop Manager is a product that both offers Server Based Computing as User Management functionalities with some unique features. The product is offering all the necessary functionalities for small and midsize companies which would like to use Server Based Computing. 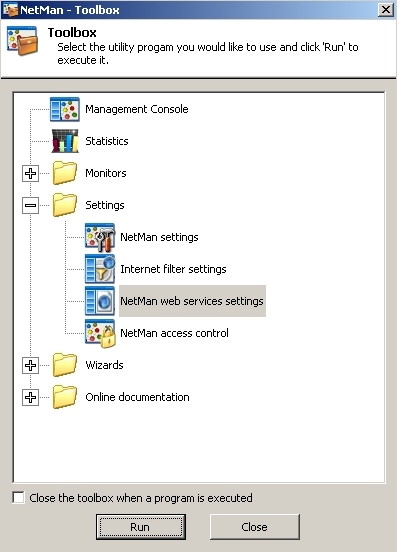 The User Management part is offering nice features, but is a bit complicated by the usage of Netman Deskop Manger specific group and the strange AD connection. I'm also a bit confused that some specific settings cannot be configured (like the placement of the shortcuts). Netman is also missing features in both the SBC computing part as User Management part that similar products are offering like CPU/Memory management and managing access to executable and folders. Summarized the product is nice combination of two markets for smaller or midsize companies (when not using Citrix already).